India has a rich tradition of nursing and nurturing pluralistic cultural and artistic heritage. But painting styles survive centuries only when adopted by unbroken generations of local populace. One such artistic heritage to survive the ravages of time, conquerors, and neglect is the Madhubani School of Painting, still practiced in the villages ensconced in the foothills of the Himalayas in eastern India. 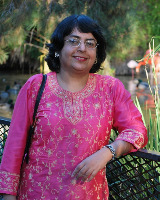 Sunanda Sahay grew up in Darbhanga, the heart of the Madhubani region in northern India. The region, part of Mithila, lies near the border of India and Nepal and carries a rich pastel of cultural legacy in art and literature. Artistic interests led Sunanda to seek out practitioners of the art from local villages and learn directly from them. Now she practices and popularizes the art in the U.S.A. near Boston, Massachusetts.